The results described on the Testimonials page, and elsewhere on this site, are the individual experiences and personal opinions of those who have purchased and used our services. 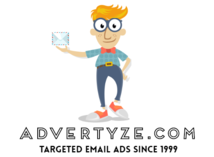 Advertyze.com does not claim these stories, opinions and results described represent the typical result that someone who purchases our products or services can generally expect to achieve. Your results may differ greatly and no claims, promises or guarantees are being made or implied about the average, typical or expected results of the Advertyze.com service or by following any other information on this site.